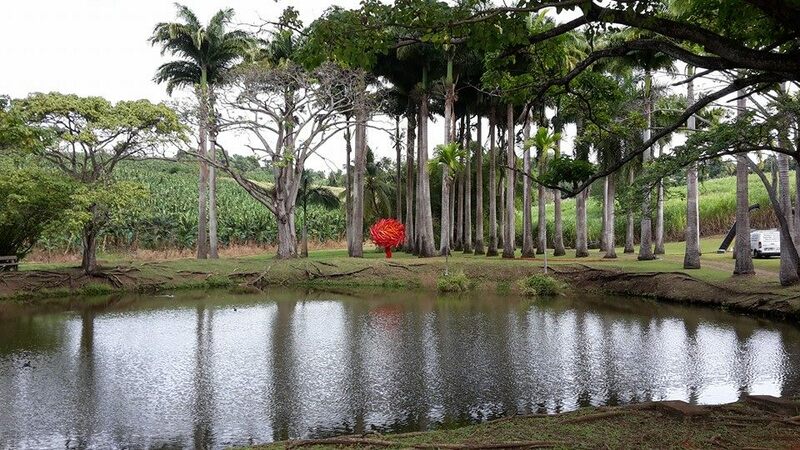 You can just take a stroll in the Fondation Clément’s sculpture garden and enjoy the serenity and harmony of this green Eden, listed as a remarkable garden by the French Ministry of Culture. This will already be a happy experience in itself. However, if your artistic curiosity is awakened, you can take a different approach to your walk and the works of art on a series of themed circuits: digital sculpture design, sculpture and mathematics, the relationship between the work and the spectator, reflection as a constituent part of the work, recycling of materials, anthropomorphism and writing in space. 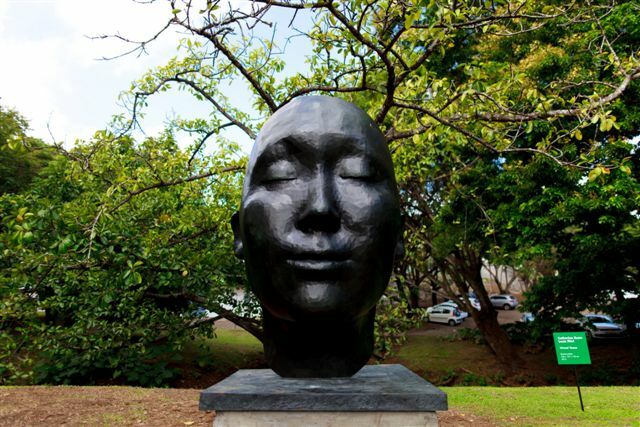 The seemingly more “traditional” sculptures are perhaps the most innovative. Virtual Yoona by Catherine Ikem and Louis Fléri, Silène luminariis sive Muflier de Borgès by Miguel Chevalier, and Heavy Metal Stack Of Six by Angela Bulloch are indeed digital creations. At first glance, the steel or bronze volumes keep their secrets hidden. Yoona was originally a 3D database obtained by digitally moulding the face of a young Korean woman. Virtual Yoona is therefore the bronze materialisation of this 3D model, made especially for the Fondation Clément. 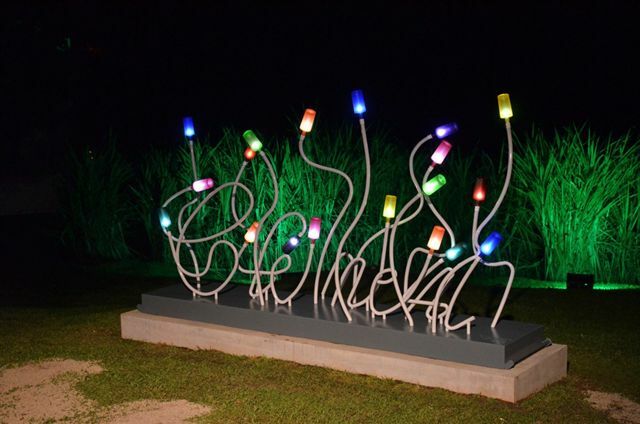 It combines a traditional sculpture material, bronze, with digital design. And beneath your watchful eye, the setting sun will reveal Virtual Yoona’s hidden side as you discover its other mystery. For Virtual Yoona has two faces. The piece by Miguel Chevalier belongs to the Fractal Flowers series. The artist modelled the conditions for life on earth in order to generate complex shapes that were then given material reality using a 3D printer. Heavy Metal Stack Of Six by Angela Bulloch is a stack of six heavy polyhedrons designed using digital printing software. Heavy Metal Stack Of Six was exhibited in the Jardin des Tuileries at FIAC 2014 and a Pink version was on display at Art Basel in 2015. Angela Bulloch’s polyhedrons, like 218.5°Arc X4 by Bernar Venet, combine mathematics and sculpture. 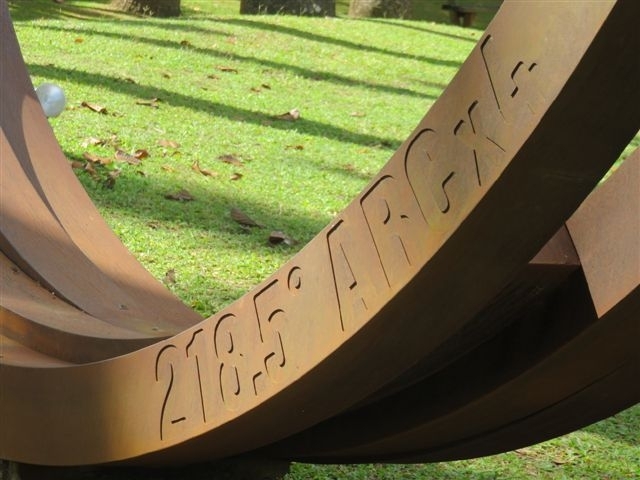 Venet’s sculpture has always maintained a close relationship with mathematics and he engraves the work with the formula of its mathematical identity. He borrows the grammar of minimal art: economy of means, rejection of illusionism and seduction, use of industrial materials and structuration of space. 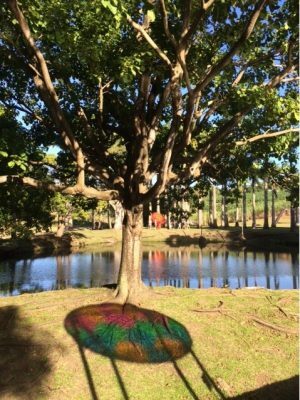 Some of the works gathered together in this park call out to the spectator, making them active participants to various degrees. Thus, the spectator’s view of Heavy Metal Stack Of Six by Angela Bulloch is affected by the way they move around. 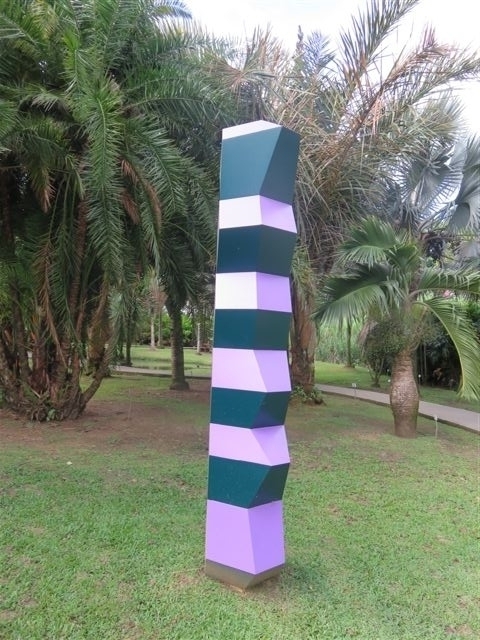 Walking around the sculpture disrupts our perception and gives the impression that the shapes are coming to life: we no longer know if the column is in two or three dimensions. The transparent surface of Daniel Buren’s Attrape-soleil aux quatre couleurs (sun-catcher in four colours), covered with stained glass-effect paper, plays with the light, sunshine and clouds. It floods the space with patches of coloured light, as the colour-catcher faces south to capture as much sunlight as possible. 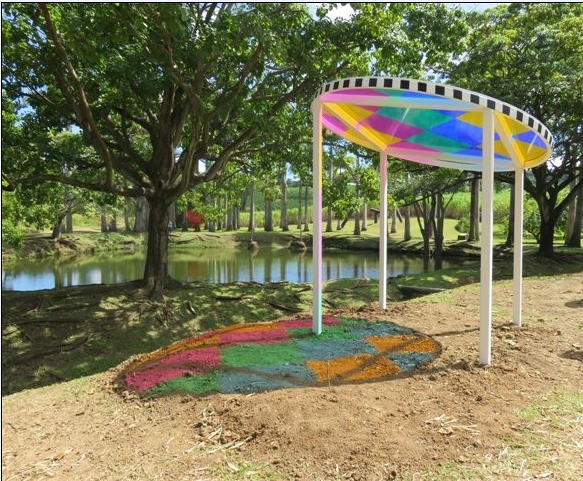 The surrounding area is then flooded with coloured halos and the work invites the public to follow the sun’s course around it and over the surrounding landscape, in the manner of a sundial. 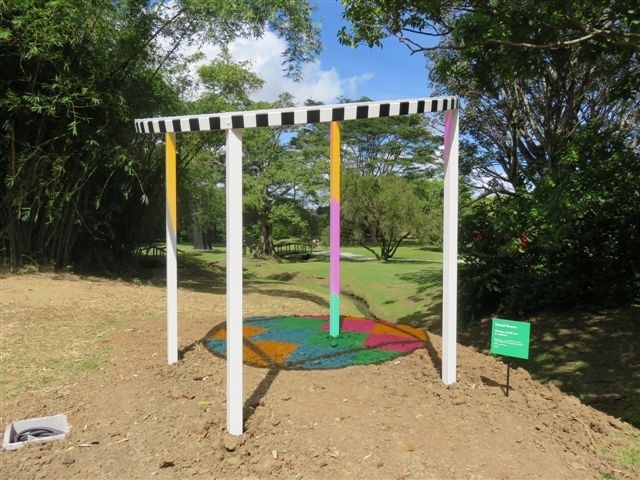 Daniel Buren never imposes a single point of view but provides multiple points of view that the public is free to choose from. 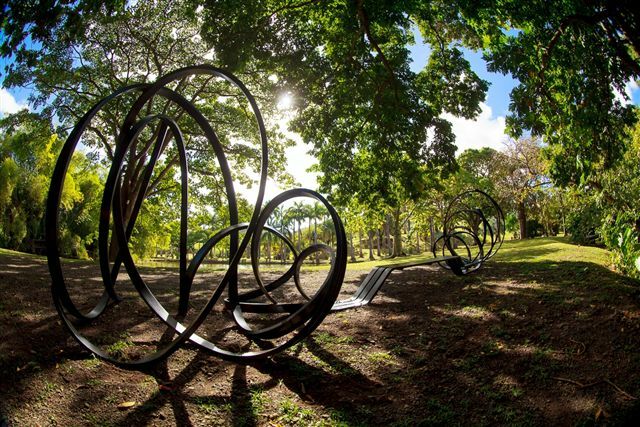 While Huge Sudeley bench by Pablo Reinoso explores the limits of steel as a material and its torsion capacities, it also simply invites the walker to stop at the bench for a moment of contemplation and daydreaming. 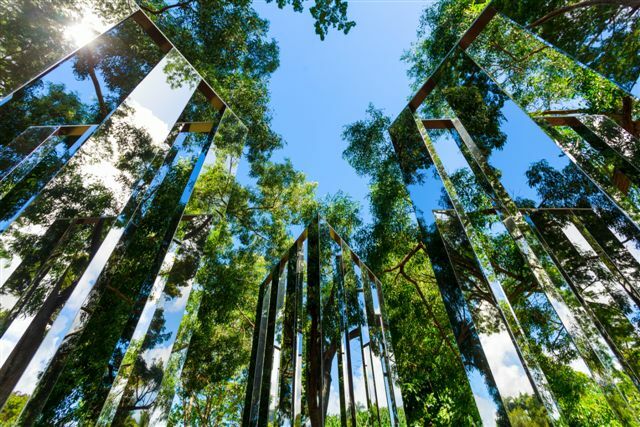 However, the Dimensional Mirror Labyrinth by Jeppe Hein plays hide-and-seek with the spectator, fragmented and multiplied in this tangle of images. The spectator loses their bearings and becomes lost between real space and reflected space. Most of these works include reflection in their creative process. 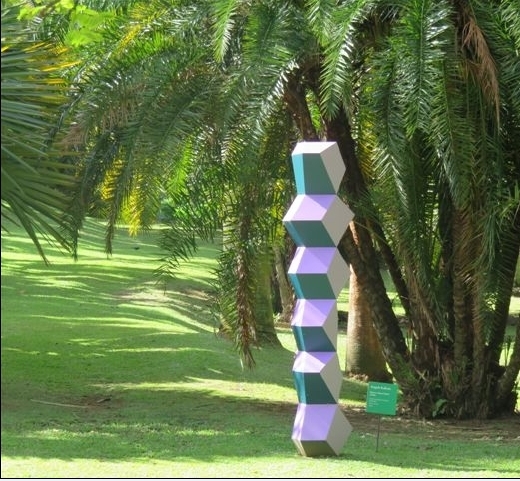 The thermo-lacquering of Angela Bulloch’s never-ending column reflects the light and vegetation around it. 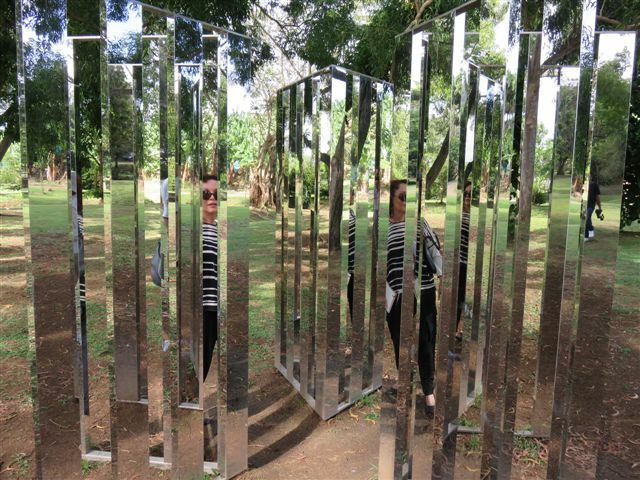 All of the surrounding foliage finds itself diffracted in Hein’s polished steel Labyrinth, as shiny and reflective as the mirror strips. The very essence of Buren’s work is the reflection of transparency. Even Christian Bertin’s piece plays with the shadows that it casts according to the sun’s course. 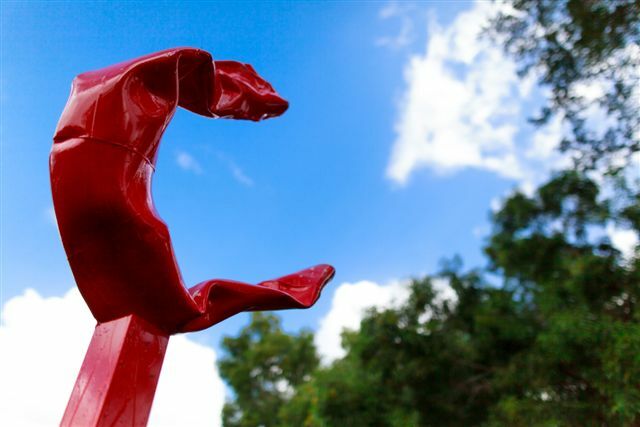 Contemporary sculpture has the particularity of breaking away from depicting the real world, freeing itself from conventional sculpture methods and promoting new materials, sometimes derived from recycling. 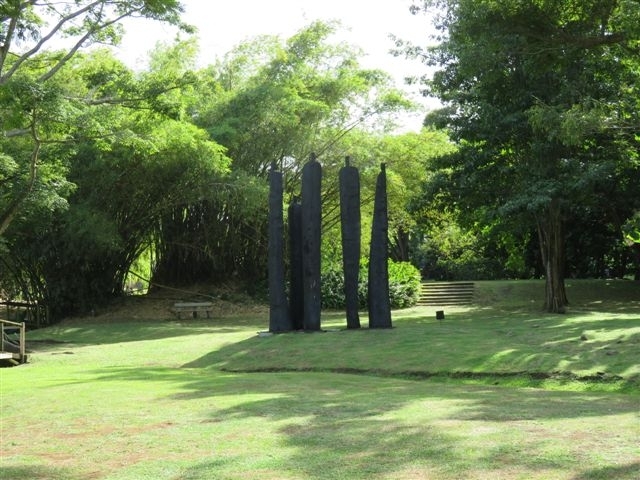 Three or even four of the sculptures in the Park are made from recycled materials: Ombres by Christian Bertin, Arithmétique des croisements by Bruce, Modesto Meditación Horizontal by Modesto Ramón Castañer and Avançons tous ensemble by Luz Severino. 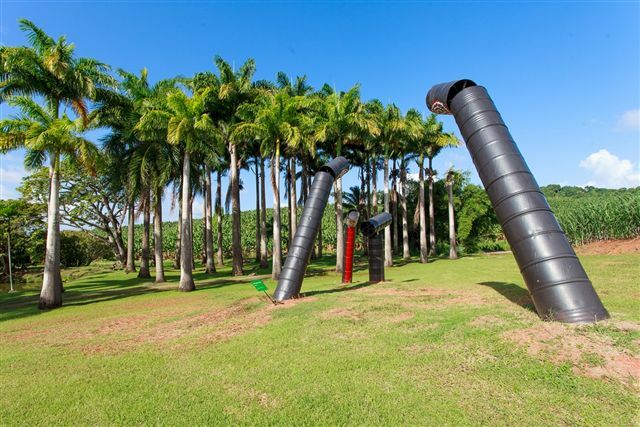 Christian Bertin takes inspiration from the Martinique tradition of salvaging and reusing objects, and produces an installation-assembly from old metal barrels that had already been recycled into water tanks before being promoted to the rank of artistic materials, and whose vaguely anthropomorphic totems stand against a background of sky or greenery. Bruce gives a second life to discarded materials. 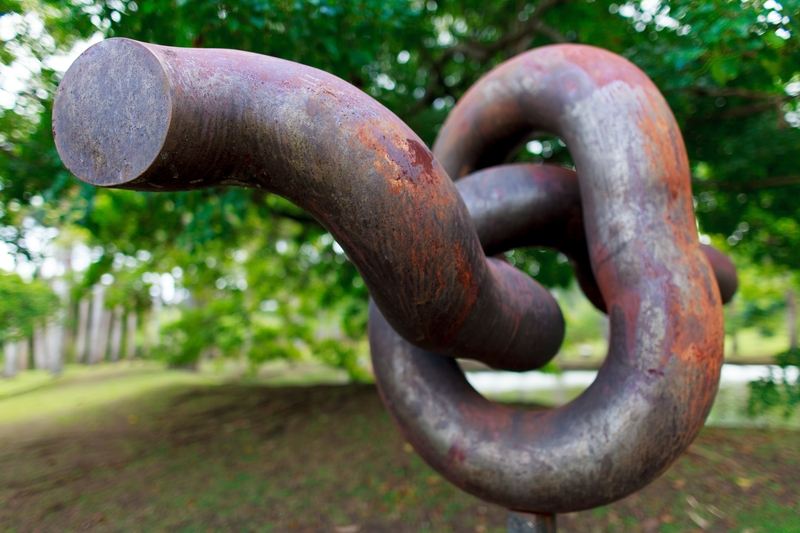 In what Vulcan forge could Modesto Ramón Castañer’s giant cylinder have been tied in a knot like a lightweight shoelace? Luz Severino makes the connection between recuperation and anthropomorphism, along with Christian Lapie. Both show a tribe walking forward (could this be prophetic?). In Jusqu’à l’ombre by Christian Lapie, a group of totemic giants carved with an axe and chainsaw from raw, burnt wood, standing proud like sentinels, deploy their immense size and engage in a dialogue from afar with Les Ombres by Christian Bertin. Thierry Alet and Jonone stretch out their writing in space. 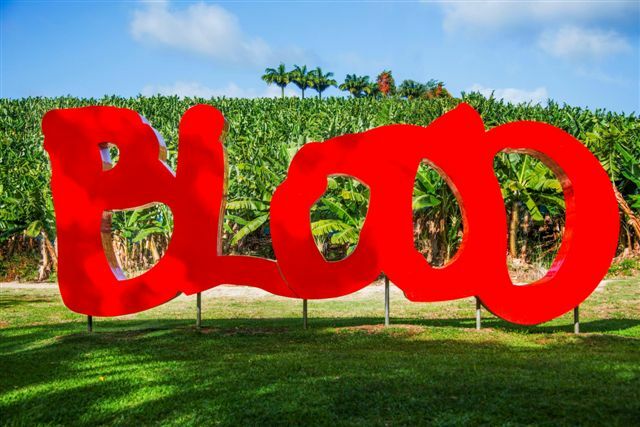 Thierry Alet’s red Blood is a tribute to the poem Rappel by Damas: “There are some things of which I was able not to lose all memory”. Meanwhile, Jonone inscribes the name of the site’s first owner, Clément, into a commemorative work commissioned by the Fondation for the brand’s 125th anniversary. Panneaux de bois contreplaqué en bouleau, armatures métalliques, mousse polystyrène haute densité, toile de fibre de verre, résine époxy, apprêt polyester et peinture polyuréthane. The anthropomorphic works of Bertin, Severino and Lapie are made of raw wood or recycled materials following traditional creative methods: cutting, welding, assembling. 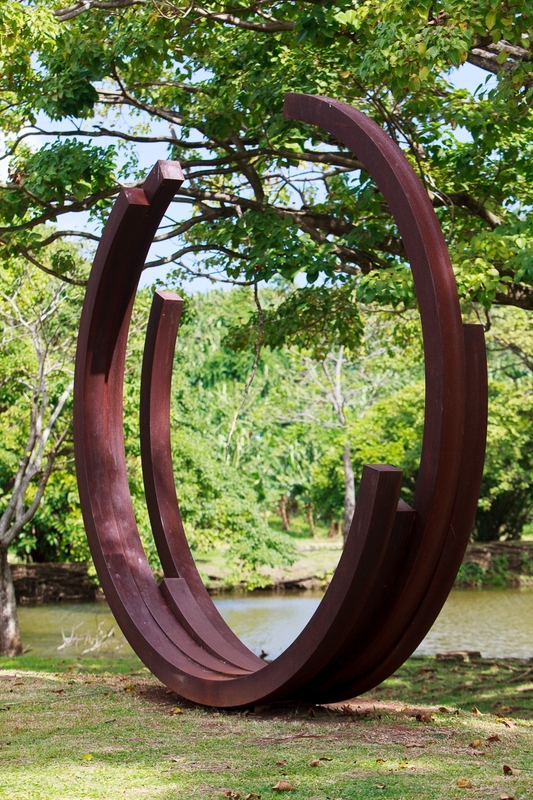 Other works derived from recycling take on an abstract form, such as those by Bruce and Castaner. Yet the creations by Chevalier, Ikam and Bulloch are computer-assisted, while Bulloch and Venet’s abstractions structure the space. Reinoso, Buren and Hein demand the spectator’s active and sometimes playful participation. The sculptures whose effects are more sophisticated, those by Bulloch, Buren and Hein, seem to be composed of elementary modules but are actually the result of complex calculations. 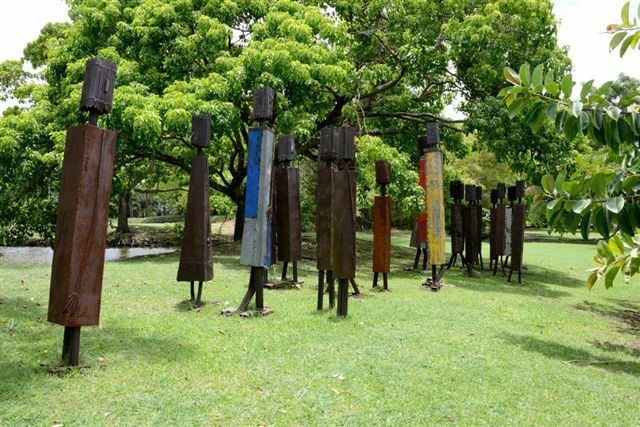 All this goes to show the diversity of the artistic offerings in this park, which provide a great introduction to contemporary sculpture. If they had but one merit – which is not the case, as they in fact have many – it would be that of demonstrating the extent to which contemporary sculpture is far from being static or unequivocal, but is on the contrary playful, multiple, and likely to provide you with a thousand-and-one different approaches.